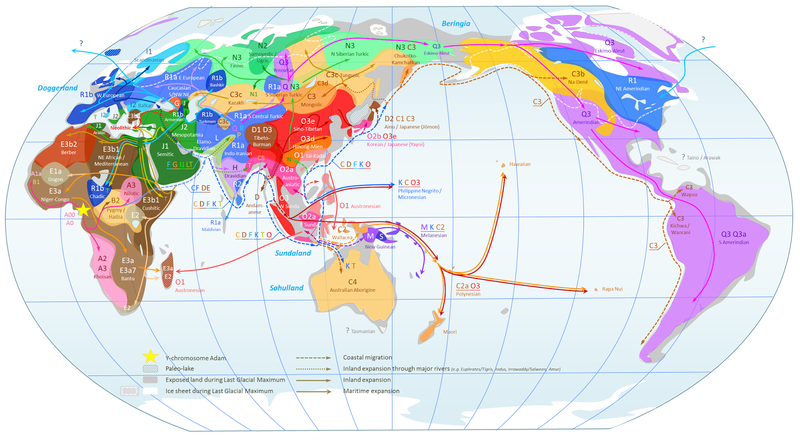 This map was posted on Wikipedia and while I would not vouch for all its details, it is nonetheless and impressive effort of visually summarizing what we know about worldwide Y-chromosome distribution. I don't know if this type of visual representation is even possible: there are peoples like native Americans, or Bantu farmers where a single haplogroup dominates decisively, but most human groups show a mix of a variety of lineages at different frequencies. The wide distribution of haplogroup G for example -which occurs throughout west Eurasia, but is only dominant in the Caucasus and some populations of the Near East- could not be guessed from this map. The labeling of R1 as "NE Amerindian" is peculiar, given the likely introduction of this lineage with European colonists. In any case, this pushes to the limit what is possible for map-making at this scale, and underscores the complexities of the present-day distribution of Y-chromosome haplogroups. The East and SE Asia/Pacific portion looks very good. And I notice D is nowhere near the coast, which at last shows its correct position with Andaman D being an outlier, not a remnant of any 'great southern coastal migration'. Africa is more than a little confusing because the map maker uses outdated nomenclature. The R1 in NE Native American is no fluke. Note that it is M173, which it the more primitive form of R1 that gave rise to the others. Moreover, R1 is associated with Indo-European speaking populations in Eurasia, and my liguistic research has lead me to conclude that there is a deep affinity between IE and the Iroquoian language family. Consider the words for 'water': Nottaway, 'awa', Tocharian B, 'war'; Kurdish, 'aw(a); Persian, 'ab'; and Latin, 'aqua'. Please note that this does not mean NE Native Americans are "white" or that some "ancient white race" preceeded "the Indians" in the Americas. Moreover, Iroquoian most resembles eastern IE languages and least resemble Celtic, which argues stongly that it came via the overland route across Siberia, and not from across the Atlantic. "I don't know if this type of visual representation is even possible: there are peoples like native Americans, or Bantu farmers where a single haplogroup dominates decisively, but most human groups show a mix of a variety of lineages at different frequencies"
Not only that it also fails in many other aspects. It shows a arrow from Semitic J1 to Northeast Caucasus indicating the J1 arrived there from the Semites. While today almost anyone should know that it is rather the other way around. At the end of the day it's just Wikipedia, what could we have expected. The R1 in NE Native American is no fluke. Note that it is M173, which it the more primitive form of R1 that gave rise to the others. What's the source for the idea that NE Native Americans have underived R1? The author states in the image description that some haplogroup names are outdated, so he is aware of it. So, no need for fault-finding. And the image is not in use at Wikipedia, means, it is not within an article. It is just a file in progress and not part of the encyclopedia. So, no need for decrying. I don't know if that 's "proven" but it's supposed to be adventurers from occitain area quite some time ago. There is X (or X2) chromosome there as well. It doesn't make much sense this form of y-dna and mtdna would introgress like that into native americans from colonists because they are pretty unusual. "...my liguistic research has lead me to conclude that there is a deep affinity between IE and the Iroquoian language family. Consider the words for 'water': Nottaway, 'awa', Tocharian B, 'war'; Kurdish, 'aw(a); Persian, 'ab'; and Latin, 'aqua'." "aqua" and its variants have a very murky IE etymology if they have one at all. Reference the Iroquoian connection, as the writer points out, there are simialr resemblances in algonkian and other groups. The Algonkian one is a completely spurious and arises out of incorrectly segmenting the form supposedly being compared. Is there some peer-reviewed article of yours we can see about the affinity between those native American languages and IE languages? Are there some probability calculations linked to this so that we can see if it is more than random chance? I have read about obvious links between the language isolate Euskera and the Quechua language family and the same for a lot of other languages. Isn't that a polysynthetic language? A weeks earlier I had this Warao book (Warao is a language spoken by native Americans in the Orinoco Delta) and it occurred to me some words there sounded "Japanes". I picked up my dusty Japanese dictionary and saw that indeed, I could detect several words that sounded the same. I suppose your studies have more basis than this. It would be interesting to see them. How likely are chance resemblances between languages? Hi there, this is the uploader of the map. Dienekes' caution makes perfect sense. This kind of map inevitably oversimplifies the real situation, that every single spot on the earth is a stack of "layers" of ethnicities, langauges, cultures, genetic profiles, etc. > And I notice D is nowhere near the coast, which at last shows its correct position with Andaman D being an outlier, not a remnant of any 'great southern coastal migration'. D2 in Japanese/Ainu/Ryukyuan is coastal. D1/D3 in Tibeto-Burman should have been originated from the Thailand coastline (near Adamanese D*), go upstream along the Irrawaddy/Salween rivers, and then enter Tibet. Also D (D*?) is reported in Thailand, Guam and the Philippines. > Africa is more than a little confusing because the map maker uses outdated nomenclature. > It shows a arrow from Semitic J1 to Northeast Caucasus indicating the J1 arrived there from the Semites. While today almost anyone should know that it is rather the other way around. I think J1 spread from Euphrates/Tigris to the Arabia in one way, and to the Caucasus in another way. I should have make the arrows clearer. > What's the source for the idea that NE Native Americans have underived R1? In Wikipedia it's labelled as R1-M173, and someone told me it's R1b. Which one is true? I got also very interested in this Native American R1 issue. It seems to me that Native American R haplotypes could be more thoroughly analyzed. I would like to know more specificly which subhaplogroup Native American haplotypes are because R-M173 is a very vague definition. They say that the most common R-M173 haplotype in eastern North America is rare in Asia and therefore unlikely to be a founding lineage. However, it seems to me that also haplogroup Q is relatively rare in Asia and does not preclude us from thinking that it is a founding lineage in America. In this relatively recent paper ”Distribution of y Chromosomes among native north americans: a study of athapaskan”, they say that ”All individuals that did not belong to haplogroup Q and C were excluded from the Haplotype data set because these haplotypes are likely the result of non-native admixture (Tarazona-Santos and Santos, 2002; Zegura et al., 2004; Bolnick et al., 2006)”. I do not know if this is a good way to proceed because there is a risk of circular reasoning, i.e. you analyze only that part of the data that conforms to your preconceptions (this critique applies also to the previous discussion on Native American Q1b). I do not know where they have been taken, but it seems to me that only the fourth haplotype is typical European R1b1a2. Some of these haplotypes seem to be quite close to each other (1st line+6th line; 2dn + 7th line). When I compared these results to FamilyTree R1b and R1a results, they seemed quite different from European haplotypes. Does anyone know better? I have read Malhi's statement that R1 in North America is the result of European admixture, but I think his interpretation of the data is not correct. I have seen nothing that rules out the model of a cohesive patrilocal population of big game hunters descending into North American through the ice free corridor that opened at the end of the Ice Age, turning east, and following the edge of the Laurentian Ice Sheet as it retreated. On the linguistics side, it should also be emphasized that Iroquoian is not derived from IE. Rather, Iroquoian and IE (in part) both appear to be derived from an earlier language family which I provisionally call "Paleo Central Asian". Dienekes - I believe the source was one of Bortolini's papers on the genetics of NA populations, but I have not been able to retrieve it. The key point is that the varieties of R1 found in NA populations that are not obviously European resemble those found in some Siberian populations. I am aware of Malhi's statement about the European origin of R1 in NA populations, but I think his analysis of the data is flawed. As I see it, there is nothing to rule out a model of a cohesive patrilocal population of big game hunters migrating down the ice-free corridor to the interior of North America, turning east skirting the edge of the Laurentian Ice Field, and following the edge as it receded as a way to explain the distribution of R` in North America.
" my liguistic research has lead me to conclude that there is a deep affinity between IE and the Iroquoian language family. " Linguistically, that sounds fringe and anyway says nothing about the internal division within R1a. Dienekes, What is the meaning of E3b1 clade (brown) in Greece? I cant make sense of it. A lot of E-V13 (>40%) exists in some published samples from the Peloponnese, and it's a generally common haplogroup in Greece. "The nomenclature keeps changing every year, and a few names became ridiculously long, like E3a7 now E1b1a1a1f1a, Q3 now Q1a2a1a1..."
I agree that is a problem but it is often difficult to know which particular haplogroup nomenclature is being used. "D2 in Japanese/Ainu/Ryukyuan is coastal". But it is extremely unlikely it arrived in Japan via the coast. Far more likely to have arrived overland from somewhere near Tibet. "D1/D3 in Tibeto-Burman should have been originated from the Thailand coastline (near Adamanese D*), go upstream along the Irrawaddy/Salween rivers, and then enter Tibet". I don't think so. It seems now considered likely that Andaman D* is probably a single haplogroup within D. That makes D far more diverse in Tibet with D1, D3 and another possibly single haplogroup, D*, to the north. "Also D (D*?) is reported in Thailand, Guam and the Philippines". Not D*. Just D1. D1 is almost certainly originally from Tibet and seems to have become widespread through SE Asia relatively recently, probably with O3's expansion into the region. Its presence in parts of SE Asia can in no way be seen as being a remnant of any coastal migration. The longer names give a far more accurate picture of the particular haplogroup's place in the phylogeny though. With the updated phylogeny we can see immediately that E1b1a1a1f1a is part of the Sahel E1b1a1a1f whereas with the E37a name such was not obvious. Similarly with Q1a2a1a1. We can understand that it is basically an American haplogroup with at least one branch in mainland Asia. But Q1a2a is one of three barnches with Q1a2b being basically Scandinavian and Q1a2c apparently SW Asian. So, even though the longer nomenclature is more cumbersome it tells us a great deal more than the simpler nomenclature. And it allows us to see ancestral connections more easily. "I think J1 spread from Euphrates/Tigris to the Arabia in one way, and to the Caucasus in another way. I should have make the arrows clearer." I know Eastern Anatolia is the place of origin. I just didn't wanted to go too much in detail and as we know the Caucasus is closer to Eastern Anatolia as Saudi Arabia for example. so the word "rather" I used fits good here. I didn't knew that some native American tribes use "awa" for water. That is indeed fascinating. Also my main problem with the map is, it labels J1 all the way into Mesopotamia "Semite" which might imply to the people that all of J1 clades and not only J1c3d are Semitic. R1 in Northeast America= NE Amerindian ! Why people are always lying, cheating and defrauding history in that part of the world ! As for the linguistic evidence, I have compiled tables of likely cognates, and the similarities between IE and Iroquoian are pervasive and include personal pronouns, number, conjunctions, and other parts of speech that are resistant to relexification. In many cases, the resemblance is stunning. For example, the 1st person singular pronoun in Cherokee is 'ayv' (where 'v; represents the nasal 'u') and in Mohawk and Nottaway, is 'i'. Compare to English 'I' and Latin 'ego'. (In both Lenape and Basque, it is 'ni'). In addition, Dr. Marianne Methun has noted in an article titled "Questionable Relatives" (http://www.linguistics.ucsb.edu/faculty/mithun/pdfs/%28In%20Press%29%20Questionable%20Relatives.pdf) that in some Native American languages interrogative and relative pronouns show the same forms, a trait which highly concentrated in Europe and uncommon elsewhere. IE and Iroquoian also show parallel development in gender systems: Cherokee retains the earlier animate-inanimate pattern while Mohawk has a masculine-feminine-neuter gender system like current IE languages. It should be noted that some linguists theorize that IE itself is a mash-up between North Caucasian languages and "some Central Asian language." I submit that this "Central Asian language" was probably closely related to Iroquoian. The NA component to the formation of IE would also solve the long-standing puzzle of the low-frequency but persistent occurrence of NA ancestry in western Eurasia, especially the Middle East and the Mediterranean areas (http://www.ancestrybydna.com/average-results.php). > But it is extremely unlikely it arrived in Japan via the coast. Far more likely to have arrived overland from somewhere near Tibet. Yes it's possible that D went from Tibet to Japan through rivers (much like O3e), but how did it arrive Tibet in the first place, which is surrounded by Tien Shan and the Himalayas? > The longer names give a far more accurate picture of the particular haplogroup's place in the phylogeny though. I agree, also this could settle disputes when new subgroups are introduced. One drawback is that we can no longer use them as simple names (like that instead of Homo sapiens we have to refer to "Animalia Chordata Mammalia Primates Hominidae Hominini Homo sapiens"). > R1 in Northeast America= NE Amerindian ! Why people are always lying, cheating and defrauding history in that part of the world ! Research found R1/R1b (and mtDNA X) in Native Americans, that is for sure, the controversy is how R1 and X got there. Some suggest more recent admixture, some link it to the Solutrean Hypotheses, but one thing is clear -- there is a pre-columbian "mixture" from Europe to N America. The NA component to the formation of IE would also solve the long-standing puzzle of the low-frequency but persistent occurrence of NA ancestry in western Eurasia, especially the Middle East and the Mediterranean areas (http://www.ancestrybydna.com/average-results.php). AncestrybyDNA is crap. Northern European populations usually show more Native American-like ancestry than do Southern European and West Asian populations in genetic analyses. "Yes it's possible that D went from Tibet to Japan through rivers (much like O3e), but how did it arrive Tibet in the first place, which is surrounded by Tien Shan and the Himalayas? Inland routes are possible, but I think coastal dispersal is more parsimonious: India >> Andaman Sea >> S China Sea >> Japan"
I think an 'inland route' is far more probable than any route through India. D is virtually unknown in India and where present is associated with Tibeto-Burman speakers. It is difficult to imagine a scenario where D could have dissapppeared through India when so many diverse Y-haplogroups survive there. Its dissappearance along a more northerly route is very easily accounted for by the elimination of human populations with the expansion of ice after any movement through the region. Of course the 'coastal route' has become very fashionable although it doesn't stand up to the slightest critical examination. By the way, your map of New Guinea supports a suspicion I have long had regarding the island and neighbouring regions. It looks very much as if S was the first Y-DND to arrive. It tended to be pushed eastward with M's arrival although that haplogroup seems to have originally been concentrated in the islands immediately north of New Guinea, Melanesia in other words. C2 was next, primarily in the 'Bird's Head' but moving rapidly along the north coast and through Melanesia and so out into the Pacific. Elements of O3a2c-P164 accompanied it, even reaching the Cook Islands. "The distribution of R1 is believed to be associated with the re-settlement of Eurasia following the last glacial maximum, and entered the Americas with the initial founding population". That is quite possible, and makes sense now you point it out. R, like Q, looks to have been originally a steppe haplogroup. The map was added to two Wikipedia articles today and I have removed it pending a talk page discussion at https://en.wikipedia.org/wiki/Talk:Haplogroup#Haplogroup_map. You/we are Wikipedia, so please speak up there now or forever hold your peace.
" R1 (M137) is found predominantly in North American Algonquian groups like the Ojibwe (79%), Chipewyan (62%), Seminole (50%), Cherokee (47%), Dogrib (40%) and Papago (38%). " Only one of those groups is Algonkian, the Ojibwe. Cherokee is Iroqouoian and Seminole is Muskogean and there is no evidence that they are in any way related, and those populations are geopgraphically distant. that goes double for the Uto-Aztecan Papago. Of course there may be explanations for whay these widely separated groups look lrealted, ad why groups clearly related to them, other members of those langugae families, don't. But it takes some explaining.
" IE and Iroquoian also show parallel development in gender systems: Cherokee retains the earlier animate-inanimate pattern while Mohawk has a masculine-feminine-neuter gender system like current IE languages." Aside from conforming to some pretty universal tendencies in the development of gender sysytems, these two systems are not paticularly similar. Those examples of pronouns are not convincing at all. You cannot compare modren languages directly to establish a genetic relationship - you cna get suggestive leads to follow, but oyu can't establsih anything that way. you have to compare the proto-languages. In this case this menas comparing the proto-language for Iroquoian at a time depth of five to seven thousand years ago. We are a couple of generations of work at best from that. People can't even aggre that Caddoan, Siouan and Iroquoian, much mre obviously similar, are genetically related. "D1/D3 in Tibeto-Burman should have been originated from the Thailand coastline (near Adamanese D*), go upstream along the Irrawaddy/Salween rivers"
"it's possible that D went from Tibet to Japan through rivers"
What makes you so sure rivers were important? I realise that until they had invented means to carry water humans would have had to live near some water resource. But that need not have been as massive as a 'river'. A small stream would have been sufficient. Perhaps you are considering rivers as a travel route but the first, presumably primitive, boats (whenever they were invented) were presumably more suited to use on still water, such as small lakes or ponds rather than moving water. Extensive movement along rivers is extremely unlikely for early migrations. And the open ocean is even less likely. Actually it's supposed to be solutrean adventurers making a western crossing that founded the iroquois as this should have been very possible (by walking over ice) at the time. Which would blow the idea that I clade covered the whole of europe and then got overrun in a few centuries of r1b migrations completely out of the water. A possible check for R1 origin in native North American populations could be to compare haplogroup distributions according to references like that provided by Ilija Petrovic above with expected Haplogroup distributions in these populations based on weighted European source populations. E.g. (made up numbers) Brits are 65% R1b, 10% R1a, 5% G, 5% I etc etc and comprise 50% of the European colonial source population and Germans are 50% R1b, 15% R1a etc and comprise 25% of the source population and so on. The bottom line is that the Native American groups should have similar ratios of European sourced haplogroups to their host colonial populations at the time of admixture. Assuming the original Native North American population was all Q, does a simple admixture model adequately represent the haplogroup frequencies observed in the current Native population? If they come out, for instance, almost completely lacking in R1a or I or whatever you would think something is up and some variants of R were likely present before European colonization. If the ratios come out as expected then colonial input is a satisfactory answer. sible check for R1 origin in native North American populations could be to compare haplogroup distributions according to references like that provided by Ilija Petrovic above with expected Haplogroup distributions in these populations based on weighted European source populations. "it's supposed to be solutrean adventurers making a western crossing that founded the iroquois as this should have been very possible (by walking over ice) at the time". That scenario is very unlikely. You have to imagine a group of people moving all that way along an ice shelf with nothing to eat along the way and with no idea of what they would find at the other end. People ar eoften stupid, but not usually that stupid. > What makes you so sure rivers were important? There is still hot debate on HOW important was water to early human subsistence and dispersal. The controversy can go way back to the evolution of Homo. But one thing is clear -- our ancestors were more skillful and more rely on water resources than we thought. Neandethals are found to hunt marine mammals, they and Homo erectus apparently sailed in the Mediterranean and SE Asia to reach remote islands, and early Homo sapiens reached Australia. The invention of boats and navigation must have been earlier than we assumed. "Yes it's possible that D went from Tibet to Japan through rivers (much like O3e), but how did it arrive Tibet in the first place, which is surrounded by Tien Shan and the Himalayas? " Or, as I have argued before, D is a remnant population - earlier and originally much more widespread than C an Q and others. It arrived with Germanic Italo Celts and the bronze age 5,000ybp. Indo European languages spread tons of Y DNa that was not there before the bronze age. http://www.theapricity.com/forum/showthread.php?91971-Y-DNA-spread-by-Indo-Europeans-(R1a1a1-M417-R1b1a2a1-L51)-(R1b1a2a-L23-R1b1a1-M73-Etc-). U cant just show how all Y DNa spread because in Europe and asia so much of it is so recent and it gets really complicated. Y DNA is just a direct male line it does not define human families. Aust DNA does i am sick of y DNA migration routes there need to be some aust dna ones it really shows how people are related and how humans spread. "Neandethals are found to hunt marine mammals, they and Homo erectus apparently sailed in the Mediterranean and SE Asia to reach remote islands, and early Homo sapiens reached Australia. The invention of boats and navigation must have been earlier than we assumed". The invention of boats need not be much before humans reached Australia, although it is extremely likely humans used some sort of boats on calm stretches of water before they reached anywhere near SE Asia. That Neanderthals ate (not necessarily 'hunted') marine animals does not prove their boating ability. Likewise with Homo ersectus. The mediterranean islands are amazingly lacking in human habitation until some time around 10,000 years ago, and islands were they are present also show evidence of faunal interchange. That mean humans need not necessarily arrived by boat becaus eother animals arrived at the same time. "Yes, rivers can be pretty rough, but I've an impression that they were also very important. Major civilizations were built along rivers"
But thiose civilizations appeared long after humans had reached Australia, and even after humans had occupied all the Mediterranean islands. Their development can hardly be used as proof of early boating ability. None of the haplogroups you list is in any way confined to the coast, nor is it automatically so that they developed anywhere near it. I agree they may have become concentrated in river valleys as they are usually more productive in resources than are regions more distant from those valleys. But that in turn does not automatically imply use of boats. On the other hand I would expect boating to have first developed along a quiet stretch of river or on a shallow lake. The coast would have been the last region exploited by boats as it is a much more difficult environment to utilise. "as I have argued before, D is a remnant population - earlier and originally much more widespread than C an Q and others". I'm inclined to agree with that although it may be no more ancient that C as a whole. Certainly more ancient than C3's expansion though. Hopefully, the following should dispel any suggestion that R1 (or mtDNA X) arrived with the Solutreans, or as a result of any Pre-Columbian transatlantic migration. The Iroquoian languages not only share a deep affinity with IE, but share specific resemblances to West Iranian languages. Note the resemblance of 'skat/sgat' in the Iroquoian languages to Sanskrit 'sa-kṛ́t'. Proto-IE forms for 'one' include '**(H)óynos, *(H)óykos, *(H)óywos;' as well as '*sḗm'. In Tocharian A, 'one' is 'sas' and two is 'wu'. In Tocharian B, 'one' is 'sa'. Note that the particle '-ek-', which is 'one' in many Indo-Iranian languages, is a component of many of the Iroquoian words for 'two'. The 't-' or 'd-' in the Iroquoian words may indicate duplication or a repeated action. Cherokee stands out as an exception: 'tali' is ofter written as 'dhal', which resembles the word for 'two' in several IE languages. Things get very interesting here because the word for 'three' is nearly the same in Persian and Kurdish as some of the Iroquoian languages. The word for 'three' in these West Iranian languages differs significantly from most other IE languages, and it may be because this original word became so sacred in IE languages that it was replaced with another word for everyday use. This phenomenon has been noted in Cherokee, where the word for 'seven' appears to be a borrow word from a Muskogean language because the original form came to be regarded as unutterable. The Korean and Ainu numerals look superficially much more similar to the Indo-European numerals 1, 2, and 3, but they are not necessarily cognate. Your examples of North American indigenous words for 1, 2, and 3 do not even look vaguely similar in any way. I really don't see how that dispels the idea of transatlantic pre-columbian contact. @Helen sorry for answering so late. There is another huge Mistake on the map. R1a in Central Asia is listed as "South Central Asian Turkic" There is absolutely nothing Turkic about this lineages because 1. It is absolutely doubtful that Turkic tribes spread it around all the way to South Asia. 2. R1a in Turkic tribes is obviously of Iranian origin. 3. The same R1a found in Turkic tribes is also frequent among Pashtuns and Tajiks which are according to this map labeled as Turkic too while only The R1a in North India seems to have been labeled as Indo-Iranian giving the impression that R1a was spread by Turkic groups. @Kurti please post any concerns directly on Wikipediahttps://en.wikipedia.org/wiki/File_talk:World_Map_of_Y-DNA_Haplogroups.png. I have merely facilitated wider input there and am no longer directly involved. I do not have the power or the knowledge to do more than that. It is amazing that so many people has questioned the most likely explanation of R1b presence in amerindians. Despite that the overwhelming evidence clearly indicates that those are the result of european males during the colony mixing with female amerindians. The problem in their minds is that they seem unable to accept that fact, perhaps because of racial prejudism (e.g., many "whites" despise "inferior" colored races). Well, shockingly enough for them, whites found female indians quite atractive, and messed with them at times when not enough european women were available. In latin america that was exactly the problem for spaniards, perhaps even more acute; so the vast majority of people nowdays have european ancestry: for example, in mexico, 80% are mostly R1b but their mitDNA is almost all either A or B.
I note that none of the DnA "Maps" consider the expansion of Pangea over the much shorter time period of 440, 000 years as opposed to millions. Matriarchal would appear to be the result of Y Chrome demise from hunting wars; and from Y moving to the parents hut of X.